In the last week of August, we loaded up the big rig (a k a our minivan) and drove the youngest of our three daughters to Baltimore to begin her freshman year at Loyola University Maryland. Mission accomplished? We now have three lovely young women enrolled at Jesuit universities and discerning their paths forward. At times all three have been frustrated with and uninspired by the institutional church, but they remain engaged in exploring and wrestling with their Catholic Christian faith, which—we would like to hope—has grounded them and helped to form them into the thoughtful young women they are today. All three have demonstrated an interest in working for social justice with other people motivated by their faith. They have worked at the ecumenical anti-hunger group Bread for the World, a Catholic Worker house in Boston’s South End, Woodstock Theological Center and a center for Central American immigrants in Washington. Our two older daughters have served as freshmen retreat leaders at Georgetown University. They have relished participation in alternative spring break trips during which they have learned from migrant farm workers in Immokalee, Fla., human rights activists in San Salvador and people working with immigrants in Arizona. Our youngest recently continued one of her favorite high school commitments by joining Loyola’s chapter of Best Buddies, through which she volunteers with individuals with intellectual and developmental disabilities. While we hope these activities have been inspired by their Catholic upbringing, we can see the girls’ faith development most essentially manifested in the simple kindness, humility and curiosity with which they encounter people on a daily basis. We take great delight in how they try to figure out and understand their vocational callings in the world; we enjoy getting to know and host the many wonderful individuals they have befriended on their journeys and witnessing both their joys and struggles. Growing up in Boston, even before they were disillusioned by the sexual abuse crisis, the girls expressed frustration with the church’s failure to incorporate women fully in to its leadership. When our middle daughter, Tessa, was little, she asked, “Mommy, why aren’t we Episcopalians? They have women priests.” She still asks that question today, and cannot understand why the Catholic hierarchy chose to investigate orders of women religious like those of the two sisters she met who visit detained immigrants in Florence, Ariz. At age 12, Marya, our eldest daughter, was asked to speak at a Boston College event, in which she tried to imagine what role she could play, as she grew older, in a religious community that she saw as denying women leadership positions. Now, almost 10 years later, as a religious studies major Marya struggles to identify herself as Catholic. We have continually responded to our daughters’ concerns by insisting that this is our church, and it is worth remaining part of the effort to see that it more fully engages the gifts of all its people in witnessing to the Gospel. In retrospect, here are a few steps we took to foster both the girls’ passions and openness to consider remaining Catholic into adulthood. We have tried to provide a supportive atmosphere in which they learned about the best of their faith tradition, could explore and take risks, knowing that it is ultimately their decision, aided by God’s grace, to pursue a faith-grounded approach to their lives. The essential message we tried to convey throughout their childhood and youth is that God loves us intensely and has created each of us with unique gifts and talents, and that we are called over the course of our lives to discern what they are and how we might use them in the service of and in solidarity with others. The girls grew up witnessing family and friends who concretely lived the language of Catholic social teaching, promoting in their daily work human dignity and solidarity, addressing structural injustice and living a preferential option for the poor. 1. Looking for inspiration. The two of us were first blessed by having as role models parents who were both exceptional and yet also completely characteristic of the generation of Catholics who had been formed during the Depression and World War II. Our daughters experienced the love of four grandparents whose deep and active faith had inspired their lives of generous service attuned not only to their neighborhood but also the wider world. One of Elizabeth’s earliest memories was of Oblate Father Matt Menger spreading a map of “Indochina” on the family’s living room floor in Pittsburgh. He had worked for many years in Laos and spoke of the people caught up in the political conflict in the region and his efforts to see the Bible translated into several Laotian dialects. Phillip grew up hearing the stories of his uncle, Father Joe Pulaski, who had served as a Maryknoll priest in China, Japan and Hawaii; both of our families had hosted Maryknoll priests and sisters over the years. Phillip was further nurtured by his participation as a teen in Connecticut’s Christian Encounter movement. It was a retreat movement founded by a Christian Brother convinced that high school students deserved a program addressing faith issues with which they were grappling. Its central premise: that they were affirmed and loved by God (a favorite button: “God Does Not Make Junk!”). We both read Thomas Merton, Dorothy Day and Henri Nouwen. When we became parents, we deliberately considered the people beyond our relatives whom we wanted our girls to come to know as role models, those who had dedicated their lives both to direct service and to engaging in the mystery of the Eucharist in the public square. From their earliest years, the girls met Maryknoll lay missioners, sisters and priests, Jesuits and Franciscans. We took them to Peru where they experienced the generous hospitality of lay leaders and Maryknoll priests with whom Elizabeth had worked. They got to know Phillip’s doctor and nurse colleagues treating the physical and psychological wounds of patients who were homeless in Boston. The dining room table remains a wonderful locale for dialogue and growth in our home. 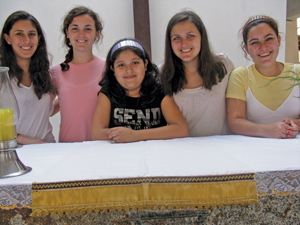 The summer before Marya started ninth grade and Tessa eighth grade, Elizabeth took them and four of their friends to a program designed by the Maryknoll Lay Missioners. The Friends Across Borders trip to El Paso and Ciudad Juarez offered a visceral, faith-based examination of our national immigration debate. As we drove through Ciudad Juarez for the first time, the six girls grew quiet as our host pointed out the many small, black crosses set against pink backdrops, each of which represented a woman whose disappearance had been left unsolved. Later, in a dusty community center outside of town, our group sat together with girls their own age who spoke of wrestling between continuing on to high school or leaving school to work in a local plant assembling car dashboards in order to help support their families. Back on the Texas side of the border, the girls used their limited Spanish to chat with some younger children on the other side of the chain-linked fence, and offered them friendship bracelets they had made earlier in the week. That evening, the girls expressed feeling overwhelmed by how arbitrary their births on this side of the border had been. The trip provided them with human faces of injustice, and through additional meetings, brief talks and films, the girls learned how Catholic teaching, social services and advocacy work approached the complex issues of immigration. 2. Practicing faith as a family. We have tried since the girls were little to pray comfortably together—at bedtime when they were young and still today at dinner, holding hands. We have encouraged people to take turns offering prayers that go beyond the food to those whom we are thinking of near and far, relatives, friends and strangers. In dinner and carpool conversations we would try gently to turn the conversation away from complaints about classmates, teachers, clothes and miscellaneous “stuff.” Instead we encouraged positive attitudes, empathy for others and social awareness and action. While the girls used to roll their eyes as Phillip would provide a brief history lesson or capsule of a favorite person of faith who wrestled to respond, the girls now smile a little more proudly at him as he asks their friends, “Do you know about so and so?”—and tells the familiar stories. We sought books on the Bible and saints with lively and evocative—not maudlin or saccharine—texts and illustrations. Our search was made much easier because Elizabeth’s sister, Daria Donnelly, reviewed children’s books for Commonweal magazine. For liturgy we chose to travel a bit farther each Sunday to attend a parish where Jesuits help out. Each became a family friend with whom the girls felt comfortable addressing their thoughts and concerns. We were also blessed to have had the girls nurtured in an annual Polish family ritual. Every Christmas Eve, Phillip’s parents have hosted the extended family for Oplatek. Before dinner, we gather in the living room as the youngest children carry a baby Jesus figure to the manger while Phil’s mother plays the piano. Phil’s parents then distribute sheets of blessed unleavened communion wafers embossed with the nativity scene. All around the room, pairs of relatives break bread together, review their relationship of the previous year and express their wishes for the other person in the year to come. Elizabeth found this completely intimidating when she joined the family 27 years ago, but now loves it. The three girls and their cousins, male and female alike, have developed a natural facility to articulate their feelings and best wishes for relatives of all ages. The annual ritual has also helped instill an enduring attitude of intentional reflection and gratitude. 3. Choosing schools. Having been nurtured in Catholic schools, we wanted our daughters to have the same opportunities. Through the generosity of their grandparents, the girls were able to attend Newton Country Day, the Sacred Heart School in Boston. They each appreciated the high school theology sequence, from Judaism and the Hebrew Bible in ninth grade, to the person of Jesus in 10th, Catholic social thought (combined with a community service placement and reflection) in 11th and world religions (Hinduism, Islam and Buddhism) in 12th. Their positive experiences participating in and helping design chapel services and annual retreats have helped all three of them to continue to be interested in effective campus ministry. Talented faculty animated by their own faith and the wider school community worked hard to incorporate the five Sacred Heart network’s goals into every facet of school life: 1. Active faith in God; 2. Respect for intellectual values; 3. Social awareness which impels to action; 4. Building of community as a Christian value; 5. Personal growth in an atmosphere of wise freedom. Back home on school breaks, the girls regularly get together for meals, not only with old schoolmates but also with the teachers who had mentored them. 4. Connecting with the communion of saints. Finally, unfortunately something not of our choosing, the girls grew up watching their extended families care—with persistent humor—for an uncle chronically ill due to a childhood brain tumor and for their two grandfathers in their final years. Two beloved aunts—Dana DeBiasi and Daria Donnelly—had lived lives of exceptional, faith-inspired service attentive to the reality and delight of grace. They died after long struggles, respectively, with ovarian cancer and multiple myeloma. Illness has bred further empathy, and a sense of what matters and what does not. Our daughters—and most in our two families—have a vivid sense of having intercessors among the cloud of witnesses who have gone before us. Now, home alone with the dog, the two of us pause, in gratitude and with hope for the days and years to come. We recognize that, as the girls have grown into women, we are perhaps less in control than ever of how they will or will not choose to identify as Catholics. Still, we hope as they grow in a faith that does justice through action and encounter, that they will come to know the Incarnate in our world and will see the church as a community and body for good. This is a lovely and inspiring article, and I commend the authors for facilitating the development of their daughters’ lived faith. I worry, however, that young parents may read this article and feel immensely intimidated. It's not always possible to send one's kids to Catholic schools, fund overseas mission trips, and come up with a host of inspiring Catholic relatives. I want to share the good news that my husband and I have three sons, 16, 18, and 22, whose one grandfather was an atheist and who attend public schools but who also share a vibrant and active Catholic faith. My advice (which does align in some respects with the article): 1. Talk as a family about what is really important in life, have difficult conversations, share authentic feelings and thoughts. 2. Find regular opportunities to pray together as a family, using words that are natural and come from the heart, and develop small rituals around the liturgical year (such as nightly lighting the Advent wreath). 3. Discuss Scripture together (the Sunday lectionary is a good starting place), learn about the Saints (celebrate family Saints’ days), and encourage children to occasionally read accessible religious books with you. 4. With your children, find opportunities to serve others. 5. Teach your children the fundamentals of the Catholic religion so they know what they believe in, and also learn together about other faith traditions so as to test and validate whether and why Catholicism is a good spiritual home. 6. Most importantly: find a church with a congregation, clergy, and faith formation program that will nourish everyone in the family. I cannot over-emphasize how important this last point is. Worshipping together in a vibrant faith community which re-vitalizes our minds, hearts, and spirits has helped my boys to become not only faithful Catholics but also retreat leaders, cantors, lectors, and parish council members. This is a great story about raising children to care about others. In spite of all your wonderful parenting, I think Tessa and Marya have it correct when they question why they would want to be part of an institutional church where woman are second class citizens. I agree with Tom Jordan. This is a great story about raising children to care about others - certainly not a story about raising children to "believe in one holy catholic and apostolic church". It's no wonder, then, that Marya "struggles to identify herself as Catholic." One can care about others without being in a church with an all-male, celebate hierarchy that claims infallibility in moral teaching - including such unmodern teaching as chastity, obedience, self-denial, and an all-male priesthood. It seems clear enough that these children recognize that their parents disagree with many of the clearly stated beliefs of the Catholic Church, yet continue to call themselves Catholic (apparently so they can be "part of the effort" to change things). But there are other organizations - for example the Episcopal Church as Tessa mentions in the story - that care for others and already share their beliefs. Tessa asks, "Why aren’t we Episcopalians? They have women priests." It's a good question. Kids do have a way of recognizing hypocrisy in their parents. This article also appeared in print, under the headline "On Their Way," in the October 22, 2012 issue.